More than just an advent calendar. Get fit this Christmas, stress-free. Is your dream body at the top of your wish list? Are you dreaming of a toned Christmas? 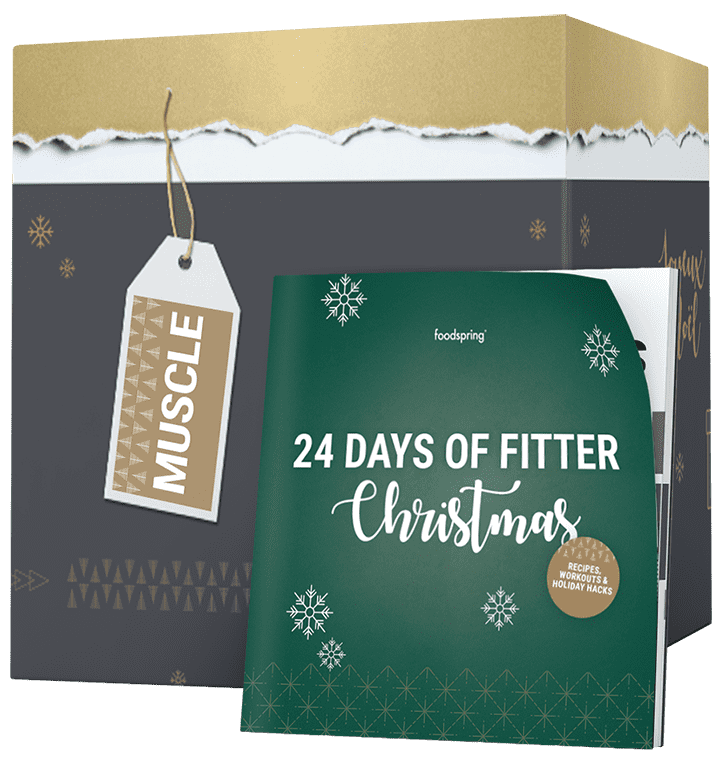 Start your 24 Days of Fitter Christmas challenge with our new Shape or Muscle advent calendars. Exclusive surprises every day to help you meet your fitness goal, plus matching recipes and training schedules. And if you want, the community workout every morning with our coaches. Fitter in 24 days, well into the new year. Get a head start on your new year's resolution. And still enjoy Christmas market treats and grandma's Christmas dinner. Our trainers will coach you towards your fitness goals in 24 days with smart recipes and time-saving workouts. No one needs extra stress at Christmas time. Elisa & Dominic break down your fitness programme and train with you on Facebook. Morning, midday and evening. But without spoiling your Christmas dinner or festive treats. Quick, flexible, effective. So you can enjoy the Christmas period stress-free. Everything you need to know about good diet, smart training and motivation. Keeping you on the ball. Get a daily personal coach team workout in your own home. Too cosy indoors. Too cold outdoors. Our coaches save you a trip to the gym and come right to where you are. Every day for 24 days, they will help keep you on the ball, live on Facebook. Ask your questions and get valuable tips on every exercise. And push yourself to the limit with our community. Strictly limited Christmas editions and new products that you can only find in our advent calendars. Hit the jackpot with the golden mystery card and a purchase value of up to 200 euro. The best thing: A 5-euro voucher is guaranteed. Every window takes you one step closer to your fitness goal. The Muscle calendar surprises you with whey products that support the muscle-building process. In the Shape calendar, you will find everything you need to stay in shape during the festive period. Which is your fitness goal? Our coaches are ready. You have allergies or intolerances? Check the list of ingredients of the products featured in the calendar. But be warned: Spoiler alert! Get the best out of your fitness food. Do you want to know how and when you should eat, drink or prepare your fitness food for the best effect? We would be happy to tell you. But not right here – otherwise, there would be no more surprises in the advent calendar, and that would be boring. That's why every advent calendar comes with a booklet with information and tips on how to get the most out of your advent gifts. If you want to know more, visit the website for the respective item at foodspring.com. There you will find all the information you need about its preparation and consumption. Our food and sports scientists would also be happy to answer all your questions, via Facebook Messenger, live chat or by email and telephone. All contact details can be found on the last page of the booklet. Which calendar is right for me? It depends what your fitness goals are. If you want to build muscle and still enjoy sweet treats, the Muscle advent calendar is perfect for you. If you want to enjoy Christmas to the fullest and still stay in shape, then – you guessed it – the Shape calendar is best for you. What products are in the calendar? All the products in the Shape and Muscle advent calendars have been selected to help you meet your fitness goals. Every day, you will find delicious shakes, snacks and special editions exclusive to our advent calendars. Let us surprise you. We'll take care of the rest. Is the Christmas guide available in my native language? Sure! Our advent calendar includes a guide in English, as the #foodspringfamily now includes members around the world who are working on their fitness with us. But it didn't make sense for us to print five languages on paper. Trees are simply more important. That's why you will find the guide in your language as a PDF link on the first page of the booklet. Do I need special equipment or a gym membership to do the workouts? Nope! All the workouts are high-intensity interval training sessions that you can complete in only 12 minutes. HIIT combines high-intensity and interval training. Especially during the festive period, you have a lot on your plate. That's why HIIT is perfect: it's quick yet effective. What happens if I miss an online workout? No stress. We know that life can get in the way sometimes. You can play all videos at a later time and simply do your workout later in the day. The important thing is that you do them. Now easier thanks to our coaches, who motive you, clearly explain all the exercises and show you how you can tick off your workout for the day in only 12 minutes. Can I indulge in festive treats at the Christmas market? Especially at Christmas time, it's important to treat yourself once in a while. In our guide, we reveal how you can enjoy a mulled wine or minced pie without the guilty conscience, and still meet your fitness goals. Advent calendar will be back in stock shortly.